Very nice and congrats on finished it. Whoo! Makes me want to buy some tulips and hyacinths. So pretty! The colors are like rainbow ice cream. I loved the doves, too - it's starting to feel like spring might actually show up one of these days. Bee-u-tee-ful! It's all the colors of spring flowers mixed together. Great job! Ooo that shawl is purty purty purty. Love the spring colors. You finished it in time for Easter! Ohhhh I do hope it brings spring to us all, especially ya'll who are under all that snow! Lovely spring colours! I have shawls draped over most of the chairs in my house; added bonus is I get to turn down the furnace. I usually wear a shawl instead of a housecoat. We had spring here on Saturday, skipped summer and fall, and are right back into the deep freeze. At least there are no mosquitoes. 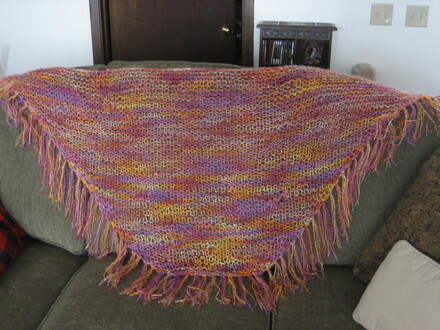 What pretty colors, and they worked so well in that knit--no nasty pooling or muddy-ing. Congrats on finishing! I hope your weather takes the hint.